Reverie offers Both FIA approved and standard battery boxes and supplied the Honda world touring car championship in 2008. 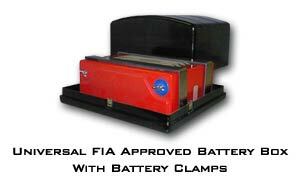 FIA battery boxes have a galvanised plate in the base of the box to meet regulations. Stainless steel battery clamp kits are available for use with the FIA battery box, which are shipped with all fixings and required parts.